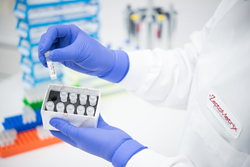 ZeptoMetrix™ Corporation (ZMC) announced today the release of 2 additional CE/IVD marked molecular quality controls to its expanding CE/IVD product inventory. “We are pleased today to introduce two Group B Streptococcal molecular quality controls to our expanding CE/IVD QC offerings. ZeptoMetrix remains entirely committed to fully support and provide our diagnostics industry with as many precise and dependable, non-infectious tools as we can to assist with accurate and reliable QC”, explains Shawn Smith, President and CEO of ZeptoMetrix. Utilizing ZeptoMetrix NATtrol External Run Controls on a consistent basis helps to monitor testing performance to maximize additional confidence in a patient’s reported results. ZeptoMetrix NATtrol Molecular Diagnostic Products are an essential part of today’s fast growing market and are designed provide the safest, most accurate and cost effective support for critical microorganism detection. The ZeptoMetrix NATtrol treatment blocks surface protein receptors on highly purified microorganisms rendering them non-infectious while allowing the internal nucleic acids to remain intact for molecular detection. Mimicking a true, infected clinical specimen, these ready-to-use non-infectious products are safe to use and refrigerator stable while controlling for all steps in molecular testing including: centrifugation, extraction, amplification and nucleic acid detection. For Sales and/or information regarding ZeptoMetrix, ZeptoMetrix Molecular Quality Controls & Panels, and Development/Custom Services, please contact ZeptoMetrix Customer Relations directly.